Hugo C Aguilar was born in Guadalajara, Mexico but now resides in the coastal town of Los Cabos, where he is constantly reinventing himself. He freely experiments with different techniques, elements, materials and art movements. With more than 20 years’ experience walking the multidisciplinary path in the visual arts, Hugo’s creative works incorporate mixed media, found objects and painting. He considers himself a constructor more than artist. 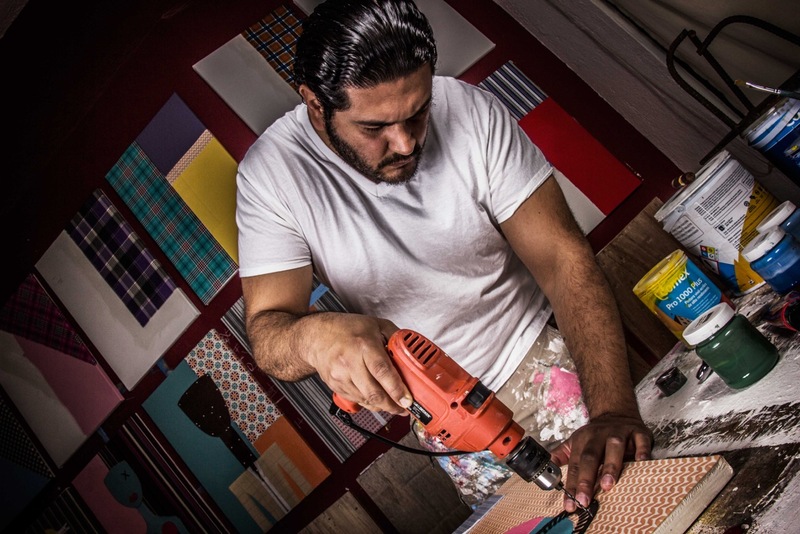 Born in Guadalajara, Mexico but now residing in the lively coastal town of Los Cabos – Hugo C Aguilar is an artist who is constantly reinventing himself, as he freely experiments with different techniques, elements, materials and art movements. 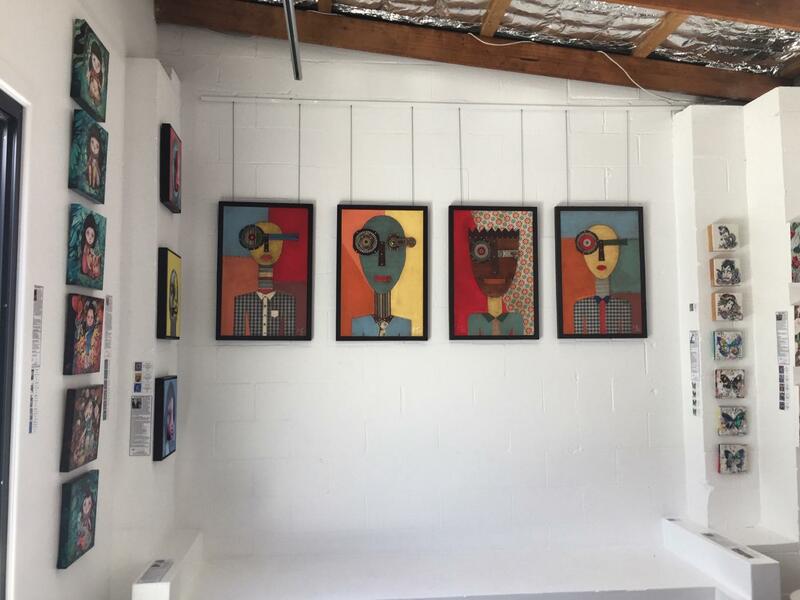 With more than 18 years’ experience walking the multidisciplinary path in the visual arts, Hugo’s creative works incorporate mixed media, found objects and painting. Everything starts from what I call “The Middle Point”. An agnostic and objective perspective, no religions, no political parties. These neutral basics have allowed me to maintain my primitive side almost intact in order to base my beliefs and philosophies in the most sincere way possible, with fair innocence, but not having this as a banner that may lead me to hypocrisy. I am a practical human who tends to complication; my tireless search takes me to this imminent encounter point with my inner self to define my life goals and to restructure my human values as well. Technically, I consider myself a constructor more than artist. I try hard to stay apart from traditional rules and pre-established techniques of art… do to my very personal and stubborn idea that gives a supreme value to my natural instinct. Today I paint less and build more; I work with freedom, I create with no limits, I simply enjoy to play and build with what I have handy. Through my work, I intend to express my faith and firm belief that despite social contamination… we can still find an equilibrium point that allows us to value ourselves in an introspective way. If we understand that from life there is nothing to understand, that in the end everything summarizes in four letters (LOVE)… then, and only then, we will be free for eternity. At this precise moment, I am just a human being in pure and full metamorphosis who doesn’t walk asleep any more. Plastic / Visual Arts (autodidact). Traditional sculpture: Master Oleg Lovykin from Rusia (personal atelier), Palo Alto, California. Drafting: Lenney College, Oakland California (not complete). NOTE: Constantly reading and documenting regarding art and everything related; composition, psychology of color and forms, history etc. – Plastic/Visual Artist and creative director. – Founder and creative director. – Official Artist member of the group. – Public Relations and Logistics. – Design and structure for creative theme projects and scenery. – In charge of directing fabrication as well as the montage. – Design and supervision of artistic and architectural projects. – Managing different administrative areas. – In charge of managing groups of 50-100 employees.